If you are doing any kind of IOS development with any of the Firemonkey IDEs (Delphi, C++Builder, RAD Studio, or AppMethod) you know how difficult working with the IOS blackbox can be. There is a utility called iFunBox which can make your life a little bit easier to manage the directory that you app is installed in on your IOS device so you can figure out what exact your app is doing. iFunBox has a few different features but the one I am focusing on (which is useful for app development) is the Manage Files feature. Basically you install iFunBox, select the IOS device that is connected to your machine, and it will show the screens of your device. From there you can select the icon of your app (or any app) and choose the Manage Files button. This will give you a file explorer of the directory (or package I’m not quite sure) where your app lives on the IOS device. Once you see the file structure of your app it will make sense as to why System.IOUtils.TPath.GetDocumentsPath is the correct path to use for your app to store files in. You will also see where the .\Startup\Documents\ is located and how it’s contents get copied to the \Documents folder when your app is first launched. You can use iFunBox to edit, copy, delete, and move files which are in your app’s directories while you are using the app (or before and after launching your app). This makes it really easy to edit your settings files for example on the fly or copy in images for your app to use. You will also be able to see if files that you have set up to deploy with your app are being deployed correctly. 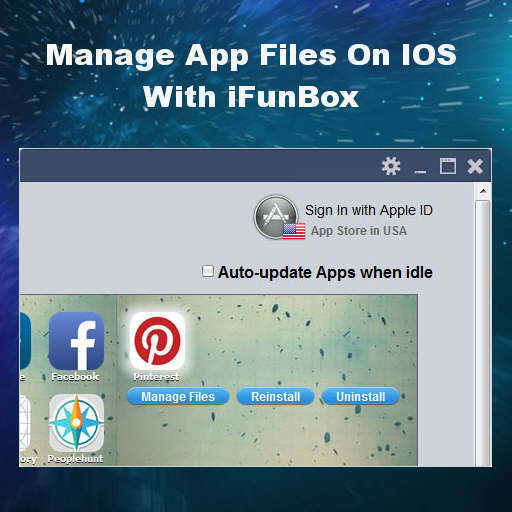 iFunBox is a free utility as far as I know and there is a version for Windows and OSX. You can combine iFunBox with the Iphone Configuration Utility to really make developing for IOS much easier. Head over and download iFunBox to start managing your Delphi XE6 Firemonkey app IPA install directory.